What is it about darkness that's so compelling these days? Looking at the critically acclaimed films of 2011 – some, it must be said, incomprehensibly acclaimed – it is startling to realize how many were about the end of the world. The apocalypse was imagined in MELANCHOLIA, ANOTHER EARTH, TREE OF LIFE and TAKE SHELTER, and nihilistic gloom and sexual violence were prominent in a number of other highly praised releases. This peering into the abyss is understandable, given the state of the world – endless war, drone bombing, the looting of the economy, and vaunted “hope and change” having turned into “more of the same, only worse.” But is there still room in the landscape for a small, humanistic film like Aki Kaurismäki's LE HAVRE, the kind of story that leaves you feeling uplifted, not defeated? I think so; despite appearances, the end of the world is not nigh. Finnish director Kaurismäki has a singularly deadpan, taciturn style that is well suited to the unsentimental handling of a tale about an elderly shoe-shiner in the French port city of Le Havre who tries to save an African immigrant boy (Blondin Miguel) from the authorities and reunite him with his mother in London. Kaurismäki named the characters in homage to French film icons and political figures; the shoe-shiner is Marcel Marx (named for Karl and played by André Wilms), a character who previously appeared in the director's LA VIE DE BOHÈME. A onetime bohemian artist, Marcel now lives a quiet life with his devoted, hard-working wife, Arletty (named for the French actress and played with touching stoicism by Kati Outinen). Arletty enters the hospital with stomach pains and receives a dire prognosis, which she insists on keeping from her husband. She tells her doctor, “He's just a big child.” Marcel is just as happy to not know the truth. While Arletty is in the hospital, Marcel encounters Idrissa, the young African boy who arrived as a stowaway on a cargo ship and is being hotly pursued by police, in particular the Javert-like Monet (Jean-Pierre Darroussin). 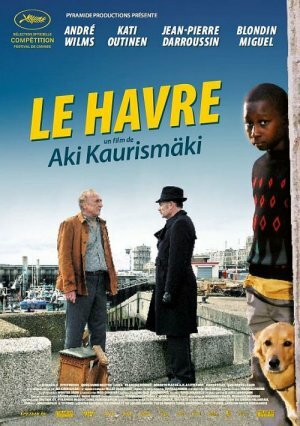 Kaurismäki's script conveys, with minimal dialogue, Idrissa's predicament and Marcel's growing compassion for the boy, whom he hides in his apartment and on whose behalf he visits the boy's grandfather in a refugee center in Calais, presenting himself to immigration authorities as the grandfather's brother (“I'm the family albino!”). The film has a piquant tone that balances dry cynicism with a fool's optimism, justified by a sweet magical-realist ending. The color photography and retro-style production design, emphasizing bright blue and orange tones, are quite striking. Kaurismäki also pays tribute to the active music scene of Le Havre (which he calls “the Memphis, Tennessee of France”) by featuring a rousing performance by the diminutive French rock star Little Bob and his excellent band. Three and a half out of four stars.